Sauna bathing is an essential part of Finnish culture and national identity. 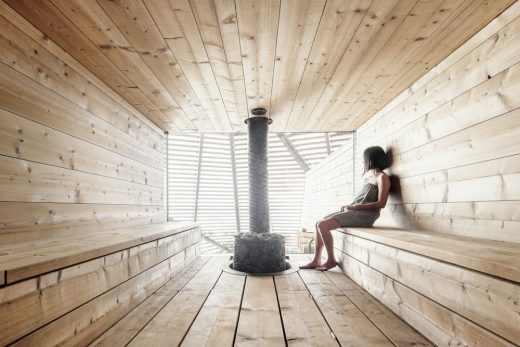 There are only 5,4 million Finns but 3,3 million saunas. 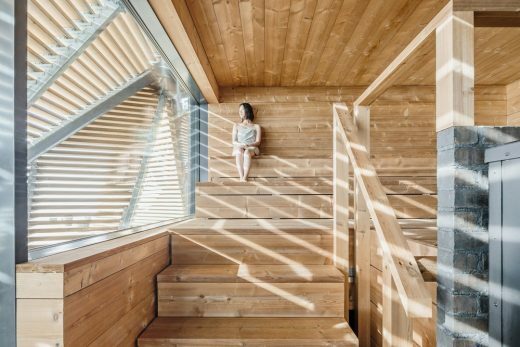 Public saunas used to be common in bigger cities but now that most new apartments have sauna of their own, public saunas have decreased dramatically in number. There are only a couple remaining. 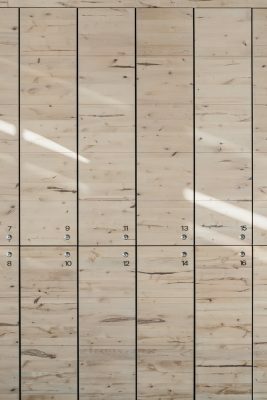 As a sense of community is becoming a more and more important part of new urban culture, many new public saunas are being planned. 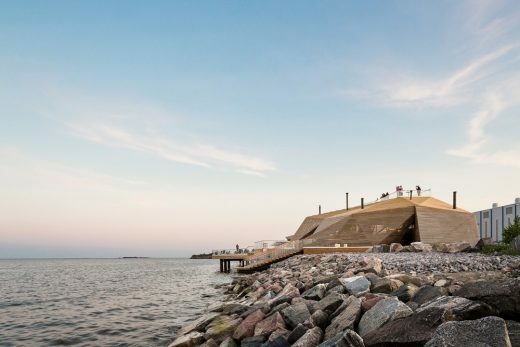 With Löyly (meaning the steam that comes when you throw water on hot stones in a sauna) Helsinki will offer foreign visitors a public sauna experience all year round – a must when visiting Finland. The project started from the city of Helsinki initiative. Hernesaari is a former industrial area on the Helsinki seashore that is being developed into a residential area. New uses are being developed for the area, while waiting for future changes to come. 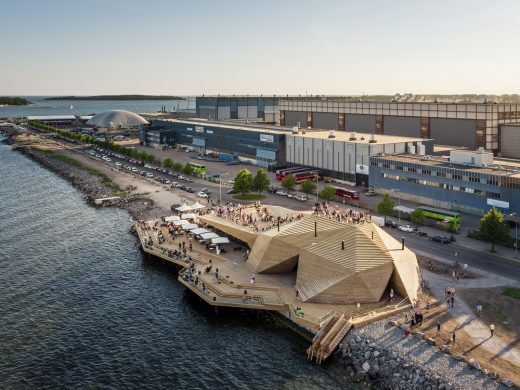 There is a cruise ship harbor in Hernesaari and the city wanted to activate the area with new functions and to serve visitors with new attractions. 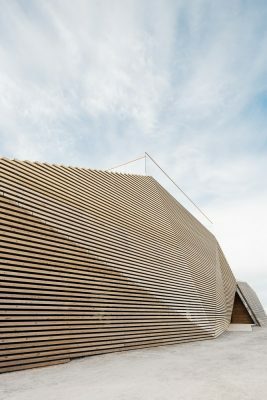 Avanto Architects started the project in 2011 designing a temporary sauna village at the furthermost end of the peninsula. The concept didn’t prove financially sustainable so the first client quit the project. 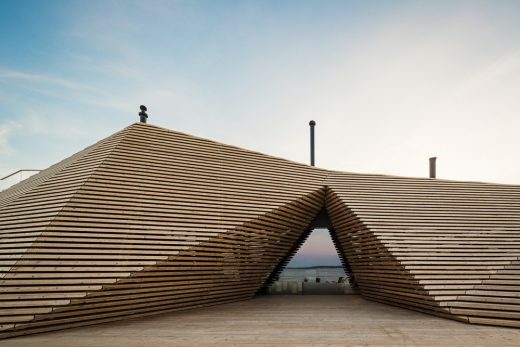 The architects developed a floating sauna with the second client but the concept proved impossible as the site faces the open sea and a floating structure couldn’t withstand high waves and pressure from ice packs. The coastline will change with future development, but the city chose an area where the shoreline will remain as it is currently. Avanto Architects developed a new free form concept with triangular faces. The client changed once again and as actor Jasper Pääkkönen and Member of Parliament Antero Vartia finally got funding, the construction works could begin. The site is unique. Being less than two kilometers away from the city centre, it is very central but at the same time the landscape is like in the outer archipelago. 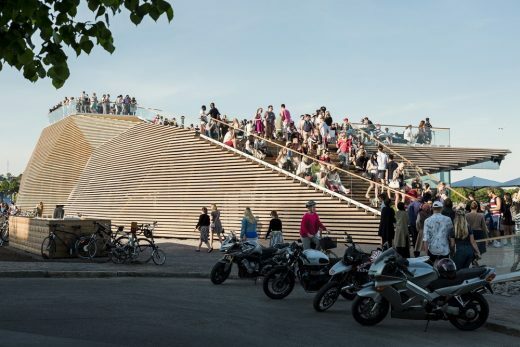 The plot is situated in a future coastal park that will be part of a broader “Helsinki park” connecting the capital city to the sea. The building was designed to be slim and elongated so as not to cut the narrow park strip. The volume is kept as low as possible so that it doesn’t block views from the future residential blocks. 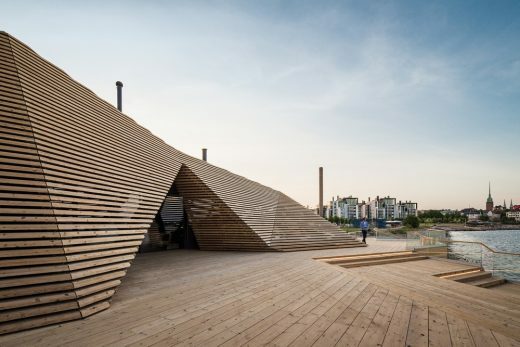 Instead of building a conventional building, the sauna is developed into an easy-going, faceted construction that is more part of the park than a conventional building. 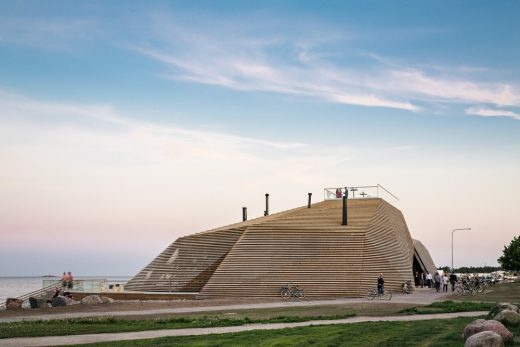 When the wooden building turns gray, it will become more like a rock on the shoreline. 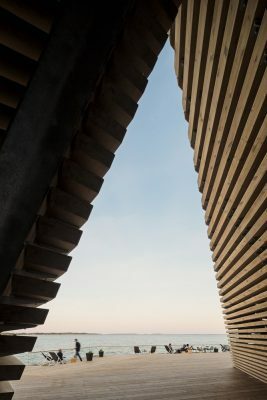 The architectural idea is simple: there is a rectangular black box containing the warm spaces that is covered with a free form wooden “cloak”. Instead of being mere decoration, the sculptural structure made of heat treated pine has several functions. It provides people with visual privacy. 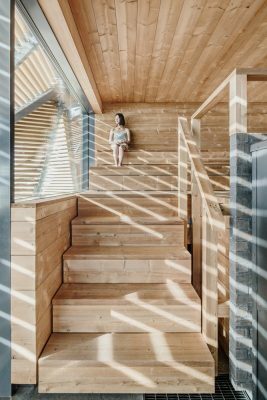 However, the lamellas don’t limit the sea view from inside it, rather they function like venetian blinds and blocking the views from outside. There are sheltered outside spaces between the warm mass and cloak to cool down in between sauna bathing. 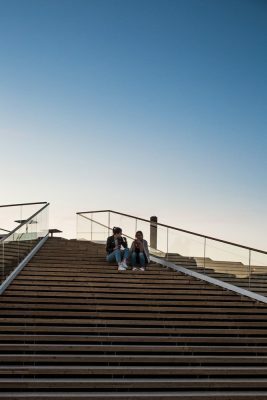 The cloak forms intimate terraces between its slopes that serve as a place to sit. 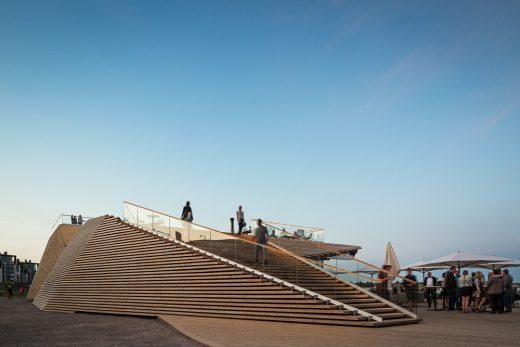 The structure protects the building from the harsh coastal climate. It shades the interior spaces with big glass surfaces and helps to reduce the use of energy to cool the building. Moreover, the stepped cloak forms stairs to climb on to the roof and look out terraces on top of the building. The construction forms a big outdoor auditorium for the future marine sports centre’s activities on the sea. There are around 4000 planks that were precisely cut to individual forms by a computer-controlled machine. The big wooden terrace is partly on top of the sea and you can hear the sound of the waves under your feet. 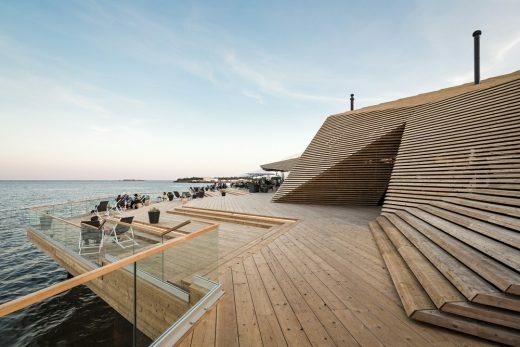 The building consists of two parts: public saunas and a restaurant. 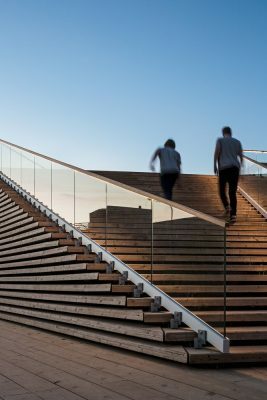 The saunas and public spaces open up to the sea, with interesting views to city center and even to the open sea. The atmosphere is calm and the spaces dimly lit. Different areas are conceived as spaces within a space. Interesting views open between closed spaces as you move from one area to the next. You enter in the restaurant that is a light and open space. From there a dimly lit sauna path leads to bathing area. Shoes are left in a wardrobe before you go to a reception desk where you get a locker key and a towel. Dressing rooms and showers are separate for men and women. A leather curtain covering the door indicates entry into the unisex area, at which point visitors need to wear a bathing suit. Traditionally men and women bath separately and naked. 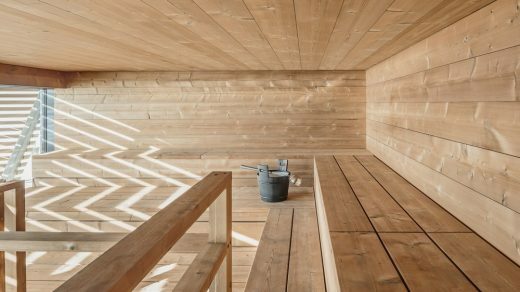 Avanto Architects wanted to develop sauna culture so that there would be a possibility bath together with your friends not depending on the gender. This makes sauna experience available also for foreign visitors that might not be used to bathing naked. 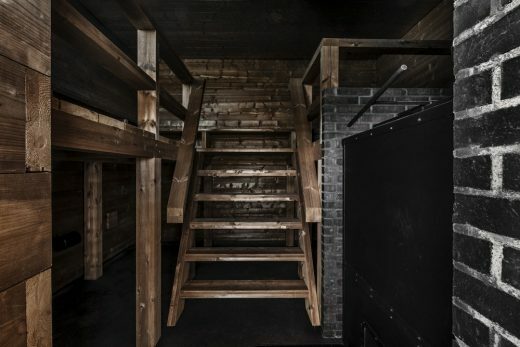 There are three different saunas that are all heated with wood: a continuously heated sauna, a once heated sauna (that is heated in the morning before the sauna is open and stays warm all evening) and a traditional smoke sauna – a true rarity in an urban sauna. This is how you can experience all sorts of Finnish Löyly during a single visit. Between the saunas there is spa area with cold water basin and a fire place room to relax in, between or after sauna bathing. You can swim in the sea and in the winter there is an “avanto”, the whole in the ice for winter swimming – a popular hobby in Finland and our office name as well.